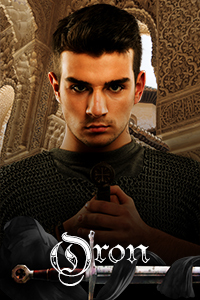 Want to know more about the main characters of the Knights of Sehaann series? Read on for short biographies of each. Main characters with headshots are listed first and I’ve presented the rest in approximate order of appearance. I’ve tried not to give away any plot points. ​Oron Navarathna: As his father's second-born child, Oron was never meant to claim the throne of Sehaann. He was never intended to rule. In fact, he was more than happy to spend his life as a pirate on the Annali ship Aeon Grimoire, away from the politics and complexity of the palace. He's a fierce fighter, a generous friend, and born to integrity and honor. He's destined for greatness as a Knight of Sehaann. Thrust into a role that he never wanted, Oron needs all of his skills to survive the cutthroat duplicity of life in the Arcinian palace. 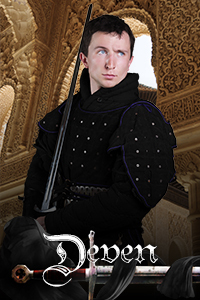 ​Deven Mathai: Eldest son of the Duke of Daslaran, Deven is the best fighter of all of his peers. He doesn't fear anything, always conducts himself with the utmost honor, and is eternally loyal to his friends. Anyone having a problem with that can take it up with his sword. Trained for knighthood since he could barely walk, Deven is well-versed in the intricacies of palace etiquette. He's quick-witted, highly intellectual, and endlessly protective. As a Knight of Sehaann, he's practically unstoppable. 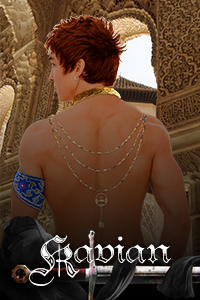 ​Kavian Nazir: As the most experienced pleasure slave at the Arcinian palace, there are few places that Kavian has never been and even fewer secrets that he hasn't heard. He's brave, optimistic, fiercely loyal, and an expert on palace life. So much more than the trappings of his social position, Kavian is either the enemy no one wants to make or the ally they don't dare to hope for. ​Kyren Sridhar: Though raised in the life of a tenant farmer, Kyren has always been more comfortable with a sword in his hands than a rake or shovel. 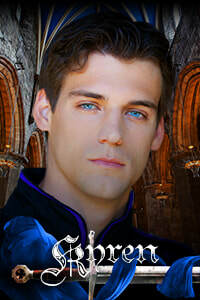 He dreams of putting his skills to the test and fighting for his country as a member of the Royal Guard. He’s insecure, with an atrocious sense of direction, but he’s loyal and generous, honorable and idealistic. Friends and family are most important to him, and he will defend them with his life. His background is almost as common as it could be. But his destiny will be the stuff of legends. ​Anish (Ani) Yamin: Ani is a slave by choice, but he struggles against the constant, merciless competition which characterizes his position. Friendship is not a luxury that many slaves get to enjoy, so Ani exists in a lonely world dictated by the whims of those ranked above him. He’s seen as arrogant, manipulative, even deceitful, but those are merely labels ascribed to him by the ones who don’t know who he really is. The truth is that he’s a caring, devoted protector who will do anything for the ones he loves. But that’s the side that he can’t risk showing to the world. That’s the kind of vulnerability that could get him killed. ​Sanjay Dinyari: As the only child of the Duke of Farashtar, Sanjay is constantly under pressure to meet his father's demands. 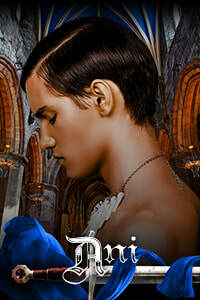 He's pledged his life to knighthood, but his loyalty seems to be constantly called into question and his mistakes have made him no friend of the crown. He's confident, cocky, and opinionated, preferring wry cynicism over inconvenient emotion. Prone to insomnia and anxiety, Sanjay's primary coping mechanism is the strong rakia distilled in his home province. He's only ever been close to two people in his life--his mother and Josha, his best friend. 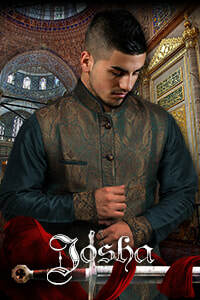 Though he tries to maintain his distance from Farashtar and his father, the duke's widespread influence could prove too powerful, even for someone as strong as Sanjay. ​Josha Meherji: Devoted, honorable, loyal, Josha is Sanjay's best friend and brother in arms. Josha has taken it upon himself to act as Sanjay's protector, stepping in to defend him when no one else will. With only enough status to barely qualify for a noble title, Josha values ethical intention and sincere integrity above inherent entitlement. He's proven his reputation through hard work, dedicated training, and honed skill, not manipulation and hypocrisy. Frequently caught between duty and compassion, responsibility and morality, he's not always confident in his decisions but he strives to do what's right. Josha's greatest asset is his empathy, but it's his affection for others which could ultimately be his downfall. ​Aadri Mathai: Aadri is the Duke of Daslaran and he's devoted to ensuring that his son has every opportunity to fulfill his potential. He's serious and careful, and always cognizant of both his and Deven's behavior. While Aadri typically leaves other nobles to rule in their own ways, he is always aware of himself and makes sure that he and his son represent their province and their people with the utmost integrity. Isala Navarathna: Isala rules over Sehaann, striving for the same even-handed fairness that was a hallmark of her father's reign. She does her best and, overall, her rule seems just and peaceful. But she's never had the same ease with her sovereignty that her father always did. She still feels just as isolated from her loved ones as ever. She doesn't even have the time or desire to marry. Ruling her country is rewarding and meaningful, but it's also very lonely. 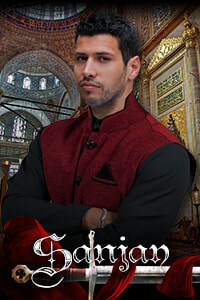 Behjan Abdil: Behjan is the Duke of Mallorion, though he spends all of his time enjoying the comforts of the royal palace in Arcini. He follows the latest trends--whether or not he really should--and is a master at palace politics. He knows exactly what to say, and to whom, and absolutely everything he does is in his own best interests. If there's a scandal, he's right there to enjoy it. In fact, he's usually the one who helped encourage it in the first place. Rayan Bamerdi: Rayan is royal advisor to the crown and head of the Royal Council. Though he's accommodating and usually helpful, his patronizing demeanor makes it seem like he's always holding something back. Agreeable as long as it serves his goals, he'd like nothing better than to guide the monarchy in the direction he likes best. Radmehr Dinyari: As the ambitious and enterprising Duke of Farshatar, Radmehr rules Sehaann's most affluent province with exceptional political skill. He carefully maintains his high-profile position as the monarchy's most fervent ally, dedicating valuable resources--including his own son--in support of Sehaann's glorious future. Radmehr's vision is drastically different than most people think, however, and he'll stop at nothing to see it realized.